Nick Wallace carrying the ball before he got hurt. After the clock hit zero at Friday’s Division 3 District Final against Coldwater, head coach Tom Marchese didn’t leave the field until he had personally thanked every player. A long line of players, many with tears in their eyes after Vicksburg fell 35-14 to the Cardinals, all stopped to hug their coach as the team finished the season with an 8-3 record. Hopes had been high going into the playoff game after the Bulldogs knocked off Marshall in their first playoff game the week prior. Coldwater received to start the game and immediately went on an 11 play scoring drive to go up 7-0. The drive burned up half of the first quarter. The usually stout Bulldog defense couldn’t stop a strong Cardinals run game that got multiple runners involved. On Coldwater’s second drive, senior linebacker Brendan Crawford recovered a Coldwater fumble, but the Bulldog offense turned the ball over on downs six plays later. On the first play after the turnover, Coldwater running back Spencer Burns broke through the Vicksburg defense for an 80 yard rushing touchdown. In the second quarter, both senior running backs Nick Wallace and Seth Benson ended up injured in the game right as the Bulldogs started to get the ball moving on the ground. Vicksburg started using designed quarterback runs by junior Brenden Lovell to make up for the loss in the ground game. Right before the half, it paid off. The Bulldogs were finally able to drive the ball deep and Lovell plowed his way into the end zone for a two-yard score. Freshman Joe Brady tacked on the extra point to cut Coldwater’s lead to 21-7 at the half. In the second half, Coldwater was first to score again after they turned a Garrett Ketelaar interception into points to make it 28-7 with just over one minute left in the third quarter. Vicksburg responded on the first play of the fourth quarter when Lovell hit junior receiver Blake Rankin with a wide open pass for a 57 yard touchdown. Brady made it 28-14 with the extra point kick. On the ensuing kickoff, Vicksburg was flagged and forced to re-kick. On the re-kick, the Bulldogs went for a surprise onside kick. It appeared that Vicksburg recovered, but the referees had a conference and decided a Bulldog had touched the ball before it went ten yards and gave possession to Coldwater. The Cardinals failed to capitalize on the great field position however and Vicksburg had another chance. On a gadget play, senior Trace Slancik threw a bomb pass that was caught in Cardinal territory by junior Deondre Lovell. But the Bulldogs then had four straight incomplete passes and turned the ball over on downs. Coldwater responded by driving the ball down the field before Cardinal fullback Sam DeMeester broke free for a 38 yard touchdown run to seal Coldwater’s win. “It stinks, but at the end of the year only one Division 3 team stands,” Marchese said. He also credited Coldwater for their tough play. While it was a hard loss, Marchese’s efforts in building a program appear to be paying off as this year was the first time ever the Bulldogs have been in the playoffs in consecutive seasons. He praised the efforts of his team, especially the ones playing their last game. “This group of seniors was no-nonsense and led by example,” Marchese said. 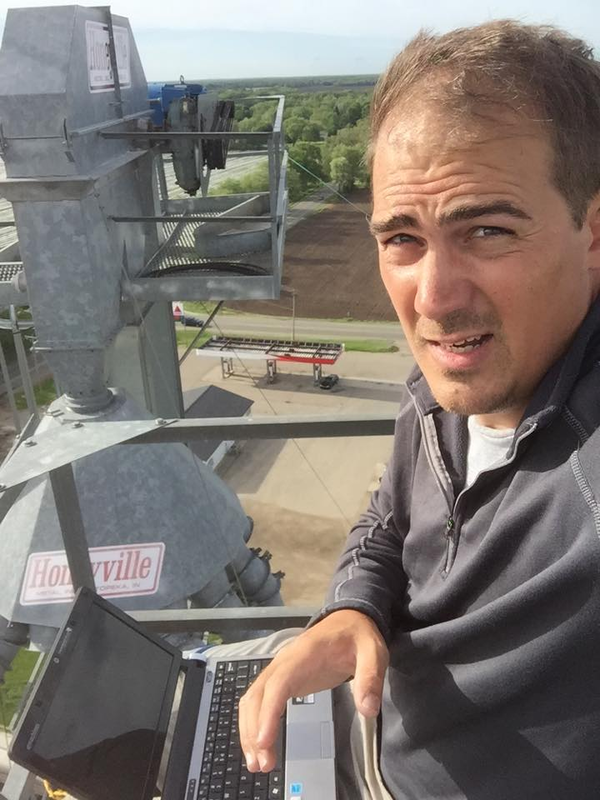 Andy DeVries atop the H & H Feed and Grain tower where his company Digital Example, LLC, also has a transmitter, and offers subscriber Wi-Fi service to residents who do not have Comcast availability. The Vicksburg Downtown Development Authority (DDA) and the village of Vicksburg are bringing outdoor Wi-Fi to the downtown through the good offices of Andy and Steve DeVries. They are two techies who grew up in the area, graduated from the local school system in the early 90s and have gone on to succeed in high-visibility technology companies. They have proposed to the DDA that they provide the wireless Internet service at no charge to the village and at $35 monthly to participating businesses, saying they feel it is time to give back to their community. It has taken over a year to put a proposal together to make this project a reality. But DDA Director Kathleen Hoyle has buttoned up the deal by getting 10 downtown businesses to contribute $100 up front to pay for the required insurance and do a 90 day demonstration test beginning December 1. If it works to everyone’s satisfaction, then it can become a permanent offering downtown for visitors to the village and those needing a good Wi-Fi connection inside their buildings. To actually make this happen, Andy DeVries will don a harness and climbing boots to climb the village water tower and place broadcast transmitters atop the tower. They will be pointed toward Main and Prairie streets to cover about a six-block radius initially. Wireless repeater boxes will be placed upon selected lampposts along the two main thoroughfares. This will allow a strong enough signal for most people seeking to connect to a hotspot, through an Internet portal offered by the village. If a business needs a stronger signal inside its building, a radio can be purchased to increase the capacity of the signal. But most of the customers in local shops will find the signal strong enough from the nearest pole outside, DeVries noted. The intention of the project is to bring today’s Internet technology into the central business district for use by visitors in a variety of ways including awareness building, product/service ordering, and creation of Internet cafes, Hoyle pointed out. The likely beneficiaries of this service would be the restaurants, who could receive orders for food from people who are attending a Vicksburg football or basketball game and want to beat the rush afterwards, Hoyle said. That might also include visitors at the annual Old Car Festival, Taste of Vicksburg, events at the pavilion or the various school buildings. Connection to the downtown Wi-Fi will be through a Village portal web page which will host advertisements for those businesses who pay for advertising space and web links from the portal page as well as provide a link to the Internet, Hoyle said. Phase two of the project will give businesses the opportunity to use the Wi-Fi as their primary Internet service to help minimize the cost of Internet access. There will be some direct costs associated with this setup, including a monthly charge of $35, a one-time cost of $67 for a radio and a $50 setup fee. All of the work will be performed by Andy and Steve DeVries’ Digital Example, LLC. They are providing the service at no cost to the village, fronting the cost of equipment in hopes of breaking even sometime in the future. They are not planning to provide residential service, pointing out that customers with Comcast in the village would not be eligible. Andy DeVries can be reached at 269-382-3334. Taylor Grigg of the Big Red Machine’s award winning Color Guard in action. The band exits the field after performing at the MSBOA Marching Festival in Vicksburg. Vicksburg’s Big Red Machine is the largest high school band in southwest Michigan, with 194 members marching this fall. It takes five or six buses and three trailers to transport all the students and their gear to their competitions in September and October, according to Vicksburg High School Band Director Ben Rosier. The sense of pride for these students when the band pulls into a stadium parking lot of another school is palpable, Rosier said. The band’s record of many first place finishes in the past competitions puts pressure on all members, new and returning, to succeed on the new model. More so considering that 25 percent of the band members have never marched before when the season begins. Somehow they are able to master the formations by the first performance in August. Rosier noted that marching band now counts for a physical education credit, thanks to the state legislature recently passing a bill to this effect. Recruiting for the band starts at the sixth grade level with 126 young people enrolled in lessons this year. Patty Stoll is the director in middle school. A big drop off in interest in many schools occurs when students enter ninth grade with almost 80 percent selecting out of many band programs, according to Rosier. Vicksburg has been able to flip this number and retain 80 percent of the incoming freshman band members. This is what created a need for 20 more new uniforms in 2015. At a cost of $400 per uniform in 2014, the band boosters paid $90,000 for 180 uniforms. Now they are out in the community, looking for more donations to cover the cost of 40 more new uniforms. They are also recruiting new volunteers to help carry out the mission of supporting the band’s many activities. A “glow-run” was held in October for runners as a way to raise money for the band. At $25 for the entry fee, boosters had over 200 registered competitors to help toward the uniform purchase, according to the chair of the event, Donna Cratsenburg-Scott. In September, the band raffled off a red and white Chrysler convertible that helped raise money and awareness of the band’s needs. 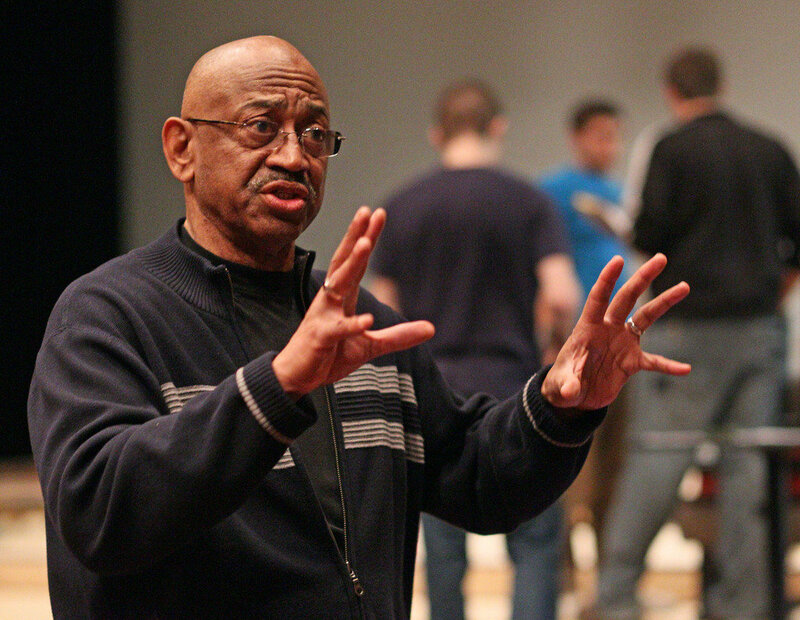 This year’s band show was developed around the number nine, which is how many years Rosier has been building the band program in Vicksburg. The planning begins with his technical team and Assistant Director Ravenna Kahler at the end of the school year. The actual practice starts the first Tuesday after July 4 and runs through the season, concluding with the last home football game in October. Band camp for a week in August is where members learn the show, but also how to deal with each other, Rosier pointed out. Each student is given their coordinates, with eight steps to every five yards. They then find their dot on the field for each sequence in the performance. The judges at each contest will look for the formations, stops and starts, music flow, and general effect of the show. All the music has to be memorized. Being in the band can bring lots of benefits for students, according to band parent Linda Lane. Her kids have benefited from leadership training, accepting responsibility, gaining music knowledge, and caring for each other. They don’t want to disappoint each other while earning great respect from the rest of the 800 plus students in the high school, she added. This year, 35 of Rosier’s band students have gone on to play in college marching bands or participate in their college music programs. The largest group of 18 is at Western Michigan University. Four are at Grand Valley, three at KVCC, two at Hillsdale, two at Michigan State and two at University of Michigan. One each is at Northern Michigan, Ferris State, Michigan Tech, and Albion. Members of the Vicksburg DDA board listen to a presentation by Emily Pantera of the Michigan State Housing Development Authority on its bid to become a Main Street ‘select’ designation. Seated from front, left to right: Pantera, Mandy Miller, Mike Oswalt, Mary Marshall, Kathleen Hoyle, Julie Merrill, John DeBault, Stella Shearer, and Steve McCowen. Revitalizing Vicksburg’s downtown became a little easier for the Downtown Development Authority (DDA) with a grant of $10,000 from the Local Initiative Support Corporation (LISC) and a loan of $50,000 from the same organization. 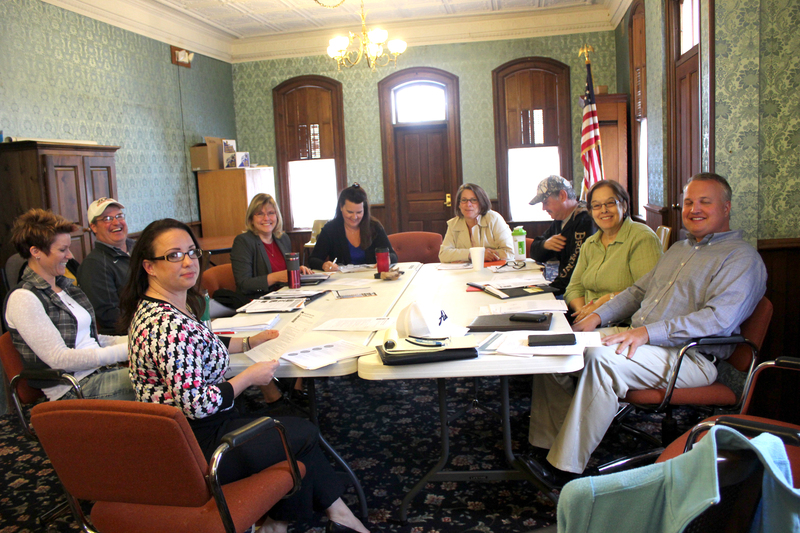 How the money can best be used for maximum impact was a big decision for DDA board members at their monthly meeting in October, according to Executive Director Kathleen Hoyle. • Use the money for design services in a revolving loan fund. • The amount of a loan for facades and other work could be up to $10,000, with repayment within three years. Currently it is $5,000 for five years. • Require an 80/20 match for the grant program. • Coordinate a list of desired contractors for building owners to call on for bids, listed as a need but not a requirement. Chuck Vliek, a representative of LISC at the meeting, ended by promising, “We will make it work for you guys.” His organization is nationwide, supported by the Ford Foundation, with offices in Kalamazoo and many other cities across the U.S.
To further enhance the downtown area, Emily Pantera attended the meeting to describe the Michigan Main Street program’s “select” designation, a goal the authority’s board hopes to achieve to gain revitalization assistance from the state. A year ago, the DDA decided to apply to be an associate community in the program for a year. The next step is to set their sights on becoming a select designation. Only three communities are approved for admittance every year, according to Pantera. If accepted it would be for a five-year commitment, at little or no cost to Vicksburg or the DDA, except in the time commitment of the director and the volunteers. Other cities and villages currently in the select program for MMS include Three Rivers, Otsego, Owosso, Saline, Hart, Grayling, Blissfield, Hart, Wayne, Wayland, and downtown Lansing. The Vicksburg Vision Campaign will host its first public fundraising event on Friday, November 20, at the new Vicksburg Cultural and Arts Center, 200 S. Main Street in Vicksburg. The event, titled “It Takes a Village to Feed a Village” will take place from 5 to 7 p.m. It will be open to the public and feature small plates from local food vendors. Cost of entrance will be one canned good per person. These canned goods will be donated to local foodbanks. Attendees of the fundraising event will be asked to make a donation in exchange for small plates at each food station. The event will also feature a silent auction with a myriad of items from local merchants and establishments. No RSVP’s are necessary. All funds raised will be donated to the Vicksburg Vision Campaign. The event is the first of many to benefit the cause. The Vicksburg Vision Campaign is a combined effort of the Vicksburg Downtown Development Authority and the village of Vicksburg. The capital campaign will fund the construction of a new nature trail system; enhancements to area parks; expansion and improvements to public parking for easy access to the downtown district; and updates to streetscapes with new sidewalks, trees, flower planters, and seating. In addition to substantial grants, the campaign will need the help of the public and local organizations to create matching funds for these projects. This fundraising event is one way that individuals can help out. 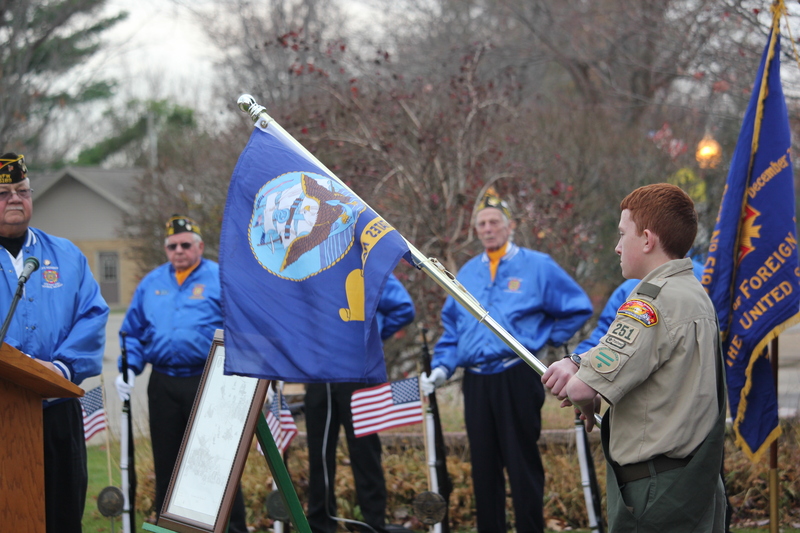 Veteran’s Day will be observed at 11 a.m. on Wednesday, November 11, in Oswalt Park. A Veteran’s Day flag ceremony in Vicksburg’s Oswalt Park at 11 a.m. on Wednesday, November 11, will celebrate the service of American military veterans. Originally this day and time was set aside to recognize the official end of World War I. The November 11 date was changed from Armistice Day to Veterans Day in 1954 to honor all veterans. The Vicksburg Veterans of Foreign Wars, Captain Charles Osborne Post 5189 will perform a special flag ceremony and a twenty-one gun salute to honor our veterans. After the ceremonies in the park, veterans and their families are invited to the Depot Museum, where the Vicksburg Historical Society plans to inaugurate a new flag pole in the front of the building at 1 p.m. Money to buy and replace a rusted and non-functional flag pole was donated by the Rotary and Lions Clubs. Members of the two clubs who are veterans will be honored during this short ceremony, according to Warren Lawrence who has been orchestrating the funding. There will be another activity to honor veterans on Sunday, November 8. The Boy Scouts of Troop 251 and their families will treat all veterans, whether they served at home or abroad, to lunch at the Vault at 1 p.m.
“This day should be more widely celebrated. Most American families have a veteran or know a veteran. Today is the day to ask them about their service,” according to Jim Hamrick, the Quartermaster for the VFW post. “Many veterans are reluctant to share their service experiences for a variety of reasons,” Hamrick said. He is a retired U.S. Air Force Senior Master Sergeant with 20 years and eight months of active duty. “The horrors of combat, sad memories, or perhaps veterans don’t want to burden others with tragic circumstances. When veterans share their experiences, the better loved ones can help and support them. Some veterans carry sad memories of service even if they never saw combat. Military service is trying no matter what the circumstances. Every veteran should be proud of their achievements. They met the challenges of basic training, advanced training, long hours and family separation. Be proud!” Hamrick said. He served in Viet Nam from 1970-71, and now lives at Kline’s Resort. Dr. Von Washington directs players in a special presentation in Schoolcraft. Dr. Von Washington will be presenting a special program for the Schoolcraft Historical Society’s November meeting held at the Ladies Library building at 7 p.m. on Thursday and Friday, November 5 and 6. Entitled “In Search of Giants, Ghost of the Underground Railroad” the retired professor from Western Michigan University will perform a reading of his newest Story Theatre creation. The play is based in present day America, with the majority of it taken from the Underground Railroad museum. It reaches back to the heart-wrenching activities of slavery. He follows the modern day activities of a college professor, searching for his ancestral roots. It uses music, drama, and the spoken word, while blending the past with the present. He will be assisted by six of his storytelling friends from Kalamazoo and Toronto. He is focusing on Pamela Thomas and the nationally known Henry Bibb who spoke so eloquently against slavery. Some of the Thomas family descendants are coming for the performance. The 92 year old great grandson and the great, great, great granddaughter who is an opera singer, who will also perform.